We need your help. The opposition is flooding Senate offices with calls against the treaty. They need to hear from our Movement now or we will not succeed. Senators Menendez and Corker and our target senators on the Foreign Relations Committee need to hear from you that you support the CRPD! We need you to call on November 4th and 11th so we can show the Foreign Relations Committee that the community is behind this treaty! Visit the new citizen action portal at disabilitytreaty.org to find information on how to contact the target Senators on the Foreign Relations Committee by phone. 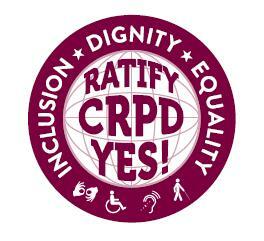 Download the CRPD sticker to share on your website, Facebook, and Twitter! Forward this message onto your lists of friends and colleagues so they can join us in sending a message to the Foreign Relations Committee that we are watching them!